The online vendor, GetKush.ca, is leading the way for Mail Order Marijuana platforms (MOM’s); with their large assortment of different discounts, strains of flowers, concentrates, topicals and other marijuana-based products. One reason GetKush.ca is growing so much in popularity is the fantastic deals and savings. The classic “the more you spend, the more you save” is a favoured business model among all consumers. Along with discounts that extend from 15-40% off, GetKush.ca also gives away free gifts for purchases of half ounces, up to a whole ounce. The free gift they are highlighting right now is their Honey Oil Vape pen; which can usually cost a pretty penny. Saving the bank is often on the forefront of my mind, but GetKush.ca has since relieved this worry for my weedy habits. The more money I find myself wanting to spend on their website adds to the money they want me to save. My favourite deal thus far is their 4 ounces with a 30% off discount because one of their newest features is to pick up to 16 different strains within that 4 ounces. The way they send their products is ideal. I found myself with a plain packaged with no discernable labels or smells. The packaging was extremely discreet, relieving any paranoia over the smell or the name kush. The buds also came in their own little air-tight bottles, properly sealed and marked with their 16 different names. Out of those 16, here are the three that I devised as my personal model ‘weedly’ schedule: morning, afternoon, and evening strains. Bruce Banner #3 is one of the love child’s of the infamous strains, OG Kush and Strawberry Diesel; however, it was not a huge secret. Knowing where this strain came from, I braced myself for a punch in the face. Rightly so, because Bruce Banner #3 has been seen to reach as high as 30% THC, which is nearing as high as THC can be found in the buds themselves (not concentrates). The buds, fresh out of their vial, were dense, dusted and brightly lit, sage green. The aroma had flooded my nose with its incredibly sweet nature. The buds of the strain were also coated with kief; almost as if the nuggets were caught by spiders, who spun kief webbing all over the bud’s florets and red, crystal trichomes. But of course, that little spider would never be able to cover Bruce Banner #3’s deliciously sweet, strawberry smell. When combusted, all of the stimulating and aromatic smells carried over to the taste, creating something beautifully delicious to smoke. The smoke itself is full-bodied, with flavours of strawberry, earth and a tinge of gas; giving off hints of its diesel ancestry. The clouds hung heavily throughout the room, like the fog from a steam room, filling the house with the pleasing scent of nature and kush. When vaped with the Arizer V-Tower, the flavour of GetKush.ca’s Bruce Banner #3 became lighter; the sweetness of course, still came through, but the earthiness grew calmer. Additionally, Bruce Banner #3 is a sativa-dominant hybrid; it is known to be favoured by most sativa-loving smokers, including myself. Sativa strains like this make me; and most people, incredibly energetic, talkative and ready for work. This is why this strain is exceptional as a morning wake-and-bake. 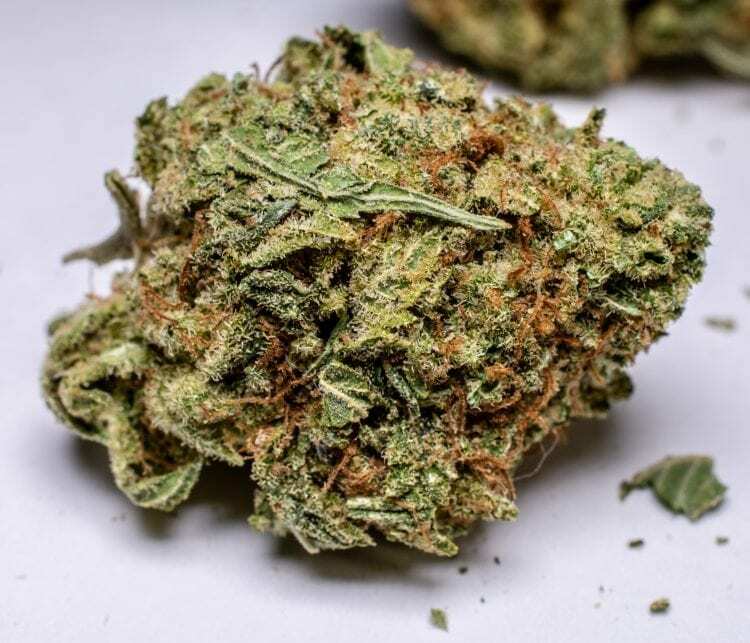 This strain can be used to help treat a number of symptoms and conditions, including (not but limited to): stress, anxiety, depression, ADD/ADHD, fatigue, gastrointestinal disorders; as well as, having a lack of appetite (as directed). I can personally attest to nearly all these, but of course, different strains produce different effects for everyone and as always, use caution if this is the first time you are taking Bruce Banner #3.. Opening the container from GetKush.ca, without looking at the actual bud, was indistinguishable from actual White Cheese; as if I was opening up a bag of fresh, stinky cheese. It is truly impressive how much it smells of cheese, unbeatable for any cheese fiend. After pouring out the vile, I couldn’t take my face out of the buds for so long that the tip of my nose got sticky from all of the resiny hairs. The strain’s colour was a grassy, medium, hunter green; however, the pistils covered the stinky buds, making those nuggets look nearly pure orange at first glance, which explains why those buds were so dang sticky. The reason why I nicknamed these exquisite nuggets, “lunchtime cheese” was because of White Cheese’s lower THC count of 14% and high CBD count of a whopping 4%. CBD does affect everyone much differently than THC does; seamlessly, it took away my anxiety, yet it also gave my sister harsh anxiety. So, with a warning, White Cheese can affect different people in different ways. Usually, with a higher CBD count, anxiety is usually lessened; however, different people react differently to the same strains. When combusted, the stinky cheese covered White Cheese’s Super Skunk lineage; which is usually heavenly funky and earthy. The cheesy diesel became a smokey, earthy flurry of tanginess when transferred from the vile to the paper. So while the smell of the strain is sharp, the smoke is an ideal mild rendition – sharp cheddar buds, with mild cheddar smoke. The sharpness extended to the hit as well, making to a perfect two-hitter, to last till the next time I could smoke. This was an amazing surprise to me with it having the lower THC count. When vaped with the Arizer V-Tower, White Cheese’s flavours dimmed down to a plume of sweet and spicy, cheese popcorn. As a strongly seasoned bud to smoke, the tower cools down the funk of the skunk to a smooth cloud of lightly cheesed air. I am very curious how White Cheese would do simmered in butter and then poured over popcorn; absolute euphoria I’m sure. The strain’s effects leave one feeling utterly happy with life; the problem would not be how the popcorn turned out, the problem would be wanting to improve on the strain’s effects at all. White Cheese left me feeling relaxed, yet uplifted; as well as, focused and I had the munchies, making it my personally optimal, mid-day strain. This sublimely balanced strain can be used to help treat a variety of symptoms and conditions, such as (not but limited to): relieving acute to chronic pain, fibromyalgia, inflammation, anxiety, depression, migraines, inflammatory diseases, multiple sclerosis, arthritis, eye pressure or glaucoma, stress, PTSD, ADHD and lack of appetite (as directed). The aesthetically pleasing, earthly green and dark orange trichomes of Violator Kush from Getkush.ca was what my mind thinks of when observing of what a perfect, marijuana bud looks like. With buds growing so tightly and closely to each other that they were trimmed to look like miniature trees, decorated for ‘Kief-mas’, with its clusters of pistils and crystals. Violator Kush comes from Hindu Kush; as well as, the sacred strain Malana. Both of these strains are famous in their own right for their amazingly high indica effects and together they make up an impeccable strain that can feel similar to a sleeping pill or a chug of Nyquil. So while this strain only has up to 24% THC, it is far more indica dominant, than it is Sativa. The aroma that exploded out of the grinder as soon as I ground GetKush.ca’s Violator Kush was like the smell of grinding down peppercorns; with parallel notes of sweet and spice. The bud was also quite piney to the nose and when combusted. It was clear how Violator Kush got its name; as it forced every one of my senses to take note, from grinder to hit. Not that the strain violated me, but definitely my nose. Earthy, piney buds often times make me feel as if I was punched in the nose with a peppercorn, and Violator Kush was not exempt from this phenomenon. Moreover, when vaped with the Arizer V-Tower, my nose thanked me. I know I wanted to smoke this; however, every time I do, I crash in my bed and fall away to dreamland, but I didn’t want to feel like I was burning my face off every time I smoked it. The tower thusly saved my life and left me with the Violator’s oaky, tannic and peppery taste, without the punch. In addition, because I have always had sleeping problems for as long as I can remember, I have had look for strategies to calm my brain down, without taking bad, habit-forming medications. Having the ability to find strains that can manage this problem, has nearly turned me into a morning person and I feel it is solely because I have had the means to fall asleep at a decent time. Violator Kush also relieved my pre-bed stress and anxiety; in addition to, making me incredibly sleepy. 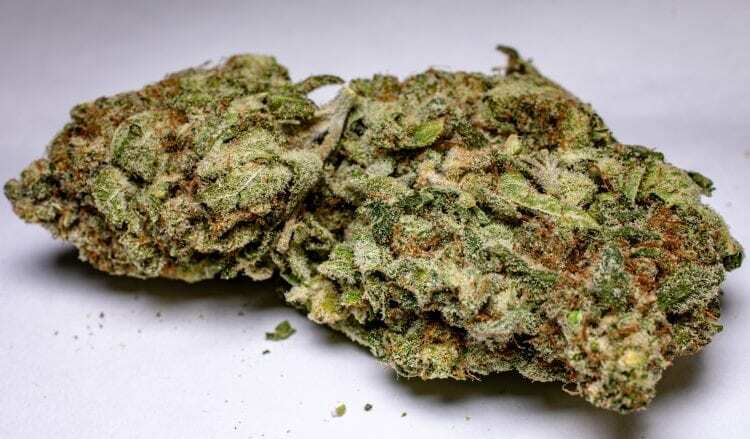 This strain can also be used to help treat a number of symptoms and conditions, including (not but limited to): insomnia, fibromyalgia, inflammatory disorders, Parkinson’s disease, depression, nausea, glaucoma, pain, multiple sclerosis, stress, anxiety, and lack of appetite (as directed). Having GetKush.ca deliveries available in my area has made my daily life immensely easier, with their quick delivery times and their innumerable amount of product and consumption options. I am thrilled to have found these three strains in the 16 that I ordered, it is very likely that next time I will solely order these three to make up my morning, afternoon, and evening ‘weedly’ schedule. The new age of mail order, online cannabis shops are proving to be quite competitive; which is why so many of these businesses offer such fantastic deals – because they know what most consumers want more and that is, to spend less. So alongside GetKush.ca’s already in-house discounts and low shipping minimum; you also shouldn’t forget to use the additional discount we offer. Please feel free to use the coupon code GTA5 to receive a further 5% reduction to the price. Have any questions or comments about GetKush.ca? Please leave us a a detailed message in the comments!